I was told about the course from the Instructor during my Scottish Rite Reunion. He was utilizing the massive tome and we wondered how to get it. He told us to get the course and also told us about MCIII. So, I purchased both MCI and III, because you don’t need to have completed MCI to do III. I actually started with MCIII, because some of my Reunion classmates are starting a study group for MCI. MCIII requires the Scottish Rite Ritual, Monitor & Guide to complete at least the first quiz, but I found that the reading overlapped with the first module of MCI. I’ve recommended for people to get both and do III first, send it in, then do I, send it in, and then you’ll have the next III in the mail to complete. Just food for thought. Good luck on the class! Good to know! I will probably just end up doing them in order since I already have Part I.
I’m surprised : lessons in a book for the Scottish Rite ? What do the lodge ? We use books. These are our brothers and sisters older who teach us the method in meetings ( one per month for 2 to 3 years). We call it : the transmission. This program is supplemental, and not part of joining the Scottish Rite. When a member joins, it’s called a reunion. I had delayed the path to the Scottish Rite because of officer obligations to the my Lodge, York Rite Bodies and Appenadant Bodies. There is a program named, The Companion Adept of the Temple, officiated by the York Rite Sovereign College that only 56 worldwide had completed successfully. I had completed this program in Nov 2014 within 8 months this return mailing/correction was very slow. I joined the Scottish Rite A&ASR SJ in the end of Oct 2014 and ordered the Master Craftsman program online that Saturday night after the reunion. I had completed the Master Craftsman 1 program in 4 1/2 months. This program is elementarily simple multi choice and assists with bite size pieces of Scottish Rite ideas. I had not understood then about being able to enroll in both Master Craftsman 2 & 3. After completion of Master Craftsman 1, I enrolled in both Master Craftsman 2 & 3 in which I totally recommend anyone to do so. The Master Craftsman 2 program is difficult since there is much involved with the 500-1000 word essays on 4-32 Scottish Rite degrees and up to 40 multi choice too. I am currently on the 7 quiz of Master Craftsman 2! It is tough!! Basically a small book every quiz! The Master Craftsman 3 program I had completed in 4 1/2 months with no issues. This was the best program of all in which every Masonic Brethren should enroll no matter if Scottish Rite or not. 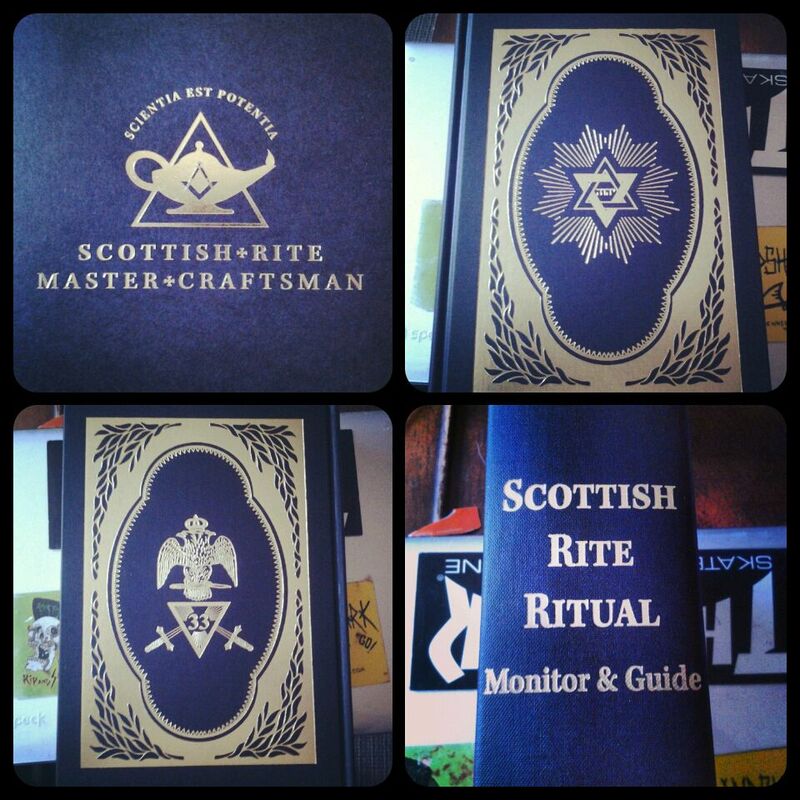 I will complete the entire Scottish Rite Master Craftsman Program in 10 months of being a Scottish Rite Mason. I am not a studious type and most syke themselves out about the reading and essays. I enjoy reading and this program is another piece of the historical Masonic puzzle.There is no modes of Masonic recognition thru any of these references of this program, basically can’t fake because enrollment in this program. I had discussed with the Brethern about enrolling spouses as to have a basic understanding about Masonic Scottish Rite open ideas. As a Scottish Rite Mason I am glad you are participating and modivating others to enroll in this program. The joint experience of the Scottish Rite Reunion with completion of Scottish Rite Master Craftsman program is a excellent path for all Masonic Brethren on the path of further light too! Glad to hear you’re enjoying the Master Craftsman program! I’ve not heard of the Companion Adept of the Temple, is that available only to York Rite members? Thank you for the reply! Unfortunately,To my understanding that The Companion Adept of the Temple Program is only offered to The York Rite Companions/Sir Knights under the jurisdiction of the General Grand Chapter, General Grand Council and Grand Encampment of the U.S.A. by enrollment through the Sovereign College but check because you never know. It’s a shame that most York Rite Companions/Sir Knights and Sovereign York Rite College members are not aware nor have interests. As I always promote Masonic historical education to Brethren or Anyone that might have a interest of course within bounds of my Masonic Obligations. There are five exams that focused on the ritualistic, philosophical, and esoteric teachings of the York Rite similar to the Scottish Rite Master Craftsman 2. This is a very in-dept and difficult program that was a challenge for me to complete as I stated that only 56 world wide done successfully. I think this is awesome! In fact, you will know more about Freemasonry than most Masons!